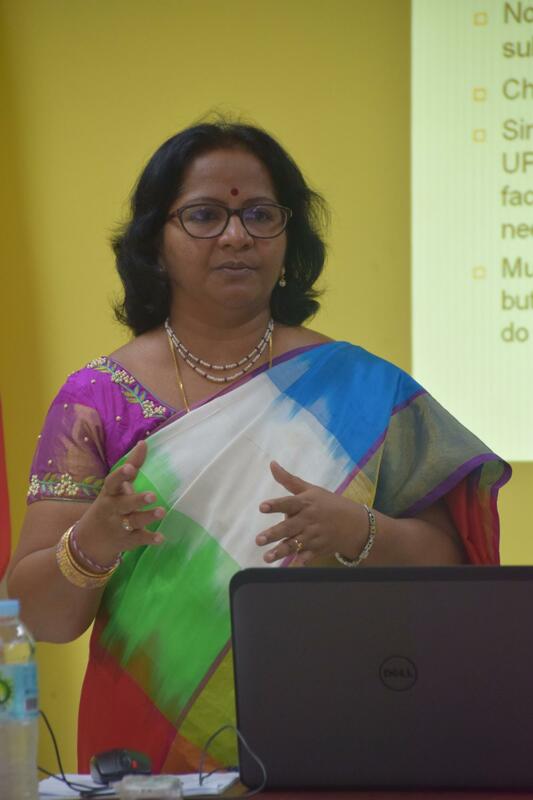 Dr. Chakrapani Pushpa of Dr. B.R.Ambedkar Open University, India and Faculty of Education’s exchange fellow presented her exit report on Open Educational Resources for Equitable Quality Education in the Philippines. The presentation was given on November 28, 2017, at Sandbox, Centennial Center for Digital Learning, University of the Philippines Open University (UPOU) HQ, Los Baños, Laguna. She enjoyed a one-month stay in the University for being selected as a recipient of UPOU’s 2017 exchange fellow program. Her proposal on open educational resources was being selected from among the three applicants of the program. Dr. Pushpa’s visit to the University aimed to understand the Philippine higher education system, to explore the open education system in the country, and to identify possible strategies for mainstreaming OERs in her own university. Information Office Director Dr. Joane V. Serrano, Vice Chancellor for Finance and Administration Dr. Jean Saludadez Dean Ricardo Bagarinao, Faculty of Education members, and other UPOU faculty members and staff attended the exit presentation. During her presentation, she emphasized that “UPOU could potentially promote the massive use of OERs in the country, being the country’s leading open and distance e-learning institution.” Its use of OERs and its offering of massive open online courses (MOOCs) can make education more open and accessible to many people, and therefore, promote lifelong learning. Some of her recommendations include crafting a policy on copyright and checking the quality of the online resources. Her study will help the University improve the teaching and learning practices applicable to other open universities worldwide.